Whether you provide a service or sell a product, you must have heard a million times that you need to start a blog. Yet, it can feel so intimidating to build it from scratch and maybe you just can’t afford to hire it out at this time, right? I know, creating your website from scratch and starting a blog can be overwhelming-but trust me, you can do it. Once you break down the process of starting a blog into simple, actionable steps, you can start writing your first post in as little as one day’s work. 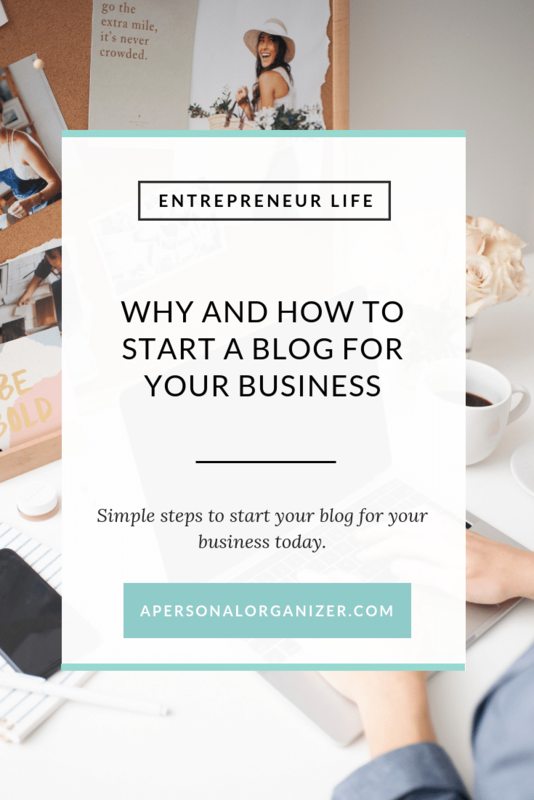 But before we jump into the steps you will take to start your blog, let’s see the reasons why you would have one in the first place. These three reasons alone make starting a blog such a boost for your business. So let’s do this! Before you do anything else, you need to choose a name for your blog. Now, you can spend as little or as much time on this step as you like, but don’t get stuck here. If you already have a business registered in your State, you should aim to own the domain for it. Make a search to make sure it’s available. Consider other languages and cultures. In my case, I was mindful of Portuguese (my native language) and Spanish. Most importantly, try to choose a name that you feel represents your business well and will be flexible as your business grows. Once you have chosen your domain or blog name, you need to check that it is available and then purchase it. Consider if you’d like to buy all extensions like .net, .org etc. When you are buying your domain name you will have the option to just buy the domain name or to buy a hosting package along with it. If this is your first blog, or you just want to keep things simple, buying your domain in combination with a hosting package is a good way to start because you can be up and running in a few minutes. Now that you have your domain, you’ll want to think about what you want to blog about. Many people suggest being as niched as possible when deciding on a blog subject. For example, if you are a professional organizer consider who is your client and provide answers to the problems your typical client has. If you specialize in photo organizing, write all about it, teaching and sharing your reader how to organize their photos. The benefit of a niche blog topic is that it allows you to hone in on a very specific market, which could be good for finding exactly the audience who needs your services and/or products. On the other hand, if you’re not sure yet what your offer will be or what you’d like to focus on as a blogger, a wide range blog on your topic (food, parenting, travel, lifestyle) can give you the flexibility to change as your business grows and as you evolve as a business owner and writer. One of the biggest things to remember is to write your blog as if you are writing to one particular person. I like to think of my favorite clients and their needs. If you don’t know this person yet, imagine him or her in your head, give them a name, ask yourself what they like, what they need, where do they live, do they have kids, where do they have fun and hang out etc. If you focus your blog posts on this person and niche like this, in time, you will attract your ideal audience. Now that your blog has a name, a host (Yay!) and you know what you’ll blog about and to whom you’ll write to, you will want to choose a theme. The number of themes that are available can be overwhelming, but keep in mind you can always change your theme at a later date if you want. So don’t get hung up on bells and whistles right now. Themes range from free to a few hundred dollars for premium ones. Studio Press (affiliate link) offers amazing options for designing your blog, especially if you want to avoid the hassle of self-hosting a blog. With Studio Press you get the design and hosting in a neat package which I used for many years. The pages on your website are landing areas that let your customers know important information about you and help him find important parts of your blog very easily. PS: Not sure your English and grammar are up to snuff? Use Grammarly! English is my second language and while I do my best to write well, Grammarly always saves the day! You can create pages for whatever you feel will be valuable to your customers. You can even create a page that highlights a specific product, book, or a course you are offering. Consistency is one of the most important parts of running a successful blog. Your readers will be waiting for your posts, so no matter how many times a month you’ll hit publish, you want to create a plan that allows you to post consistently and promote these posts on social media. Remember, when you’re creating content, quality is always more important than quantity. If you can only post once a week- or once a month – that’s ok.
Just keep it consistent and of high quality, posting content that your readers will find useful and entertaining. Pinterest and social media platforms literally change the game when it came to images on your blog. Images are an important part of your blog identity and will help you spread the word about your posts. Once you start posting regularly choose one or more stock photo sites where you can find images that compliment the style of your brand. There are many stock photo sites to choose from. I love hautestock.co (affiliate link) and these are the images you see on my website. Again, consistency is key. When it comes to social media for your business you will need to create campaigns to post and share your content, as well as other people’s content (OPC) that is relevant to your niche. Each social media channel has its own ideal posting days and times, which you’ll find on the “insights” area of your Facebook, Instagram and other social media platforms. So do your research and get to know what type of content works where and when. If you are at a point on your business where you can afford to outsource, this is a great task to delegate to the experts! Get help for your social media by hiring a social media manager to help you create and schedule content to boost your business. Congratulations! You now have all the tools you need to start your blog. By following these steps you will be on your way to running a successful blog in no time. With some commitment and a little creativity, your blog will quickly become one of the most valuable tools that you use to grow your business.